Being that Spain is one the world’s top #3 wine producers, it’s surprising that Madrid doesn’t have more wine bars like Casa Gonzalez, quite simply my favorite in the city. Not only does Casa Gonzalez offer over 40 wines by the glass from some 200 references, it’s also one of Madrid’s most inviting delicatessens, whose fascinating family history dates back over 80 years, carried on today by Paco Gonzalez, grandson of the shop’s founder. 1931 is a pivotal year in Spanish history, as it witnessed the birth of Spain’s first true democracy, La Segunda República (The 2nd Republic). That same year, a humble man from La Mancha named Vicente Gonzalez, left his job at Puerta del Sol’s famous La Mallorquina café, to open up a shop on calle León #12, in the heart of Madrid’s Literary Quarter. Vicente’s tienda de barrio acted as a neighborhood store that specialized in products such as Manchego cheese – regularly brought from La Mancha and matured by Vicente himself – cured meats, cold cuts, olive oil, and canned goods. Ironically, what Vicente didn’t sell was bottled wine, as this was rarely seen in Spain’s shops before the 1960’s. Prior to that, buying wine for home consumption meant going to a bodega, such as Vinicola Mentridana, to fill up one’s own container from a bulk source. 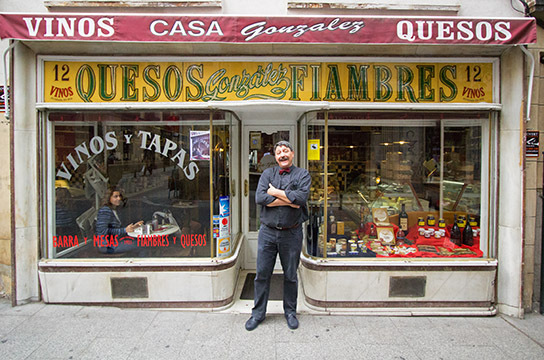 As for the shop’s name, it refers to a tradition followed by Spain’s small businesses, where the owner and his family actually lived on the premises, truly making it the Gonzalez House. In the late 1930’s, the duration of Spain’s Civil War forced many Madrid businesses to close, and only by selling sought-after wartime substitutes – and the occasional black market item – did Casa Gonzalez manage to remain open. As a dedicated supporter of the Republic, Vicente allowed local Socialists to use the shop as a meeting place during the course of the war. Following the Republic’s defeat however, those meetings moved underground to the shop’s basement, an act that landed Vicente a 4-year prison term once the group was discovered. Only after Vicente’s return, did his grandson Paco get his start as an errand-boy, delivering cestas de navidad, or Christmas gift baskets to shop customers. That young, lanky adolescent can still be seen today in one of the black and white photos hanging opposite the bar, as he towers over his cousin with a cheeky grin. Paco couldn’t have known that one day he would inherit the shop, and be forced to transform it in order to survive. Stiff competition from supermarkets in the 1990’s saw the closure of many a tienda de barrio. In response, Paco narrowed the shop’s focus to wines and cheeses – expanding the selection of both – along with other delicatessen products, matched by light meals served at the bar. Casa Gonzalez also serves as a wonderfully peaceful café, where you can enjoy your morning coffee and chocolate croissant while gazing at passers by from the corner window table. Paco’s smartest move however, was to convert the back storage area – his grandparent’s former home – into a wildly successful Madrid wine bar. While wine is of course found in every Spanish bar, the selection is often limited to Rioja, Ribera del Duero, and Rueda. But the variety of wines by the glass at Casa Gonzalez is unmatched in the capital. That’s why you’ll often wait for a table on any given night, such is the love by in-the-know locals and visiting oenophiles, not to mention sommeliers like myself who do their wine tastings there. And although wines by the glass are only offered from less expensive bottles, the price/quality ratio for that category is excellent, which is one of the bar’s main attractions. The bar’s throwback charm is another, with the original shelves – from where the wine is sold today – its scale, and coffee grinder all on display. Although what’s most endearing, and most often missed by customers, is a frame containing the paper pesetas Vicente earned at La Mallorquina – part of the very savings used to open Casa Gonzalez back in 1931. In short, I can’t think of a reason not to go to Casa Gonzalez the next time you’re in Madrid. One of the waiters – Dani below – will even sing for you, if you ask politely. Casa Gonzalez – calle León 12. Open Monday – Thursday, from 9:30am til midnight, Friday – Saturday til 1am, and Sunday 11am – 6pm. Metro Antón Martín (Line #1). 914 295 618. Looking for things to do in Madrid? Get to know the city more in depth with a Historic Madrid Walking Tour, Gastronomic Madrid Tapas Tour or a Madrid Wine Tasting.